Cleveland's Premier Landscape Professional Best Of Houzz 2015, 2016! Our landscape process begins with your vision. 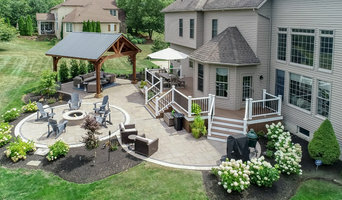 With more than 80 years of combined landscaping experience, Exscape Designs is a full-service design/build company headquartered in Novelty, Ohio. We have proudly served the Greater Cleveland area and Northeast Ohio region on a wide variety of projects throughout the years. Our award-winning expertise speaks for itself. Our mission is simple: we want to help homeowners, property managers, homebuilders and architects bring their visions to reality, while also enhancing the property value and quality of life for the clients and communities we serve. Bill Dysert, the CEO of Exscape Designs, is responsible for providing continued growth and project direction to the company. Through his leadership, our Cleveland landscape design firm has developed and installed naturally beautiful landscapes all over the Greater Cleveland area since 2004. From a gorgeous spa to a covered patio with an outdoor fire pit, the possibilities are endless. And now, by adding 3D design services to our toolbox, Exscape Designs can offer homeowners the opportunity to visualize their space and experience the creative designs before they are built. Our team is passionate about bringing your landscape vision to life. Share your ideas with us to start the process of designing your dream outdoor space. We'd love to discuss your project. We recommend visiting our website to see our work in action before contacting us at: <a rel="nofollow" target="_blank" href="https://www.exscapedesigns.com/contact">https://www.exscapedesigns.com/contact</a>. For more than 20 years we have been working for our clients to ensure they are happy to be home. Award-Winning Landscape Designs Best of Houzz 2017 - 2019! Since 1981, I have created more than 3,000 landscape designs, ranging from small residential projects to large commercial projects. No matter the scope, I tailor each project to the desires and needs of the individual client and make it a priority to solve landscape challenges quickly and effectively. Projects may involve scale-drawn master plans with hardscapes and plantings or on-site consultations using instant visualization tools. My design guidance enables you to understand the possible options available to you regarding hardscapes, structures and plantings. I approach each client's project with problem solving and space planning that considers a range of possibilities, unlike design-build firms who often promote only what they specialize in. Michael Dirr, the author of The Manual of Woody Landscape Plants, has called me “the best landscape designer in Cleveland.” I designed and produced three winter holiday shows for Cleveland Botanical Garden. I also served as project coordinator for the National Park Service’s Second Annual Historic Landscape Conference. Sharing experiences and insights with those interested in landscape design remains extremely important to me. In the past, I have taught landscape design at the Cleveland Institute of Art and have served as president of the Northern Ohio Perennials Society and The Design Network. Here are just a few of my non-residential projects: •Blossom Music Center -Shaker Heights Country Club •Mayfield Country Club •The Cleveland Public Library’s Sensory Garden for the Blind •Ruffing Montessori School •Lake Hospital System •Secrest Arboretum •University Suburban Medical Center/South Euclid My work has been featured in: * Cleveland Plain Dealer •Garden Gate&Easy Gardening magazines •Sunset Northeastern Landscaping •Ohio a Bicentennial Portrait. Typical Job Costs: $1,000 - 3,000 I am a landscape designer. I DO NOT INSTALL or MAINTAIN LANDSCAPES. I help: DIY, your contractor or I can recommend contractors. Hourly rate: $125 weekdays /$150 weekends. ASK ME ABOUT THE AFFORDABLE OFFICE VISIT OR ONLINE CONSULT OPTION. Email photos of site & address to LeslieScottDesign@yahoo.com. Look at HELPFUL INFORMATION in Projects for photo guidelines. Upon receipt we will discuss how I might tailor my design services to best help you achieve your landscape goals. Tournoux Landcare is a Family Owned, Design & Build Company. When creating our clients outdoor room we design for elegance and functionality. Tournoux builds with natural and manufactured stone depending on the theme of your property. Our horticulturalist use a blend of plant material to ensure color throughout the four seasons. Eric graduated from West Virginia University in 1993 with a Bachelor of Science in Landscape Architecture. He began his professional career in South Florida designing high-end residential properties from South Beach to Key West and overseeing the construction of these projects. A native of Northeast Ohio, Eric returned to Cleveland in 1997 to work for the City of Cleveland’s Parks Department. Eric enjoyed designing park and recreation facilities and working as a project manager on these projects. Eric’s passion for Residential Landscape Architecture and Garden Design eventually led him into design/build work in 2006. Since then, Eric has worked for some of Cleveland’s premier Landscape Development Firms. Eric brings outstanding design and graphic skills along with a solid knowledge of plant material and construction methods. Eric is a registered Landscape Architect with 25 years of professional experience and offers unique and creative design solutions to his projects. 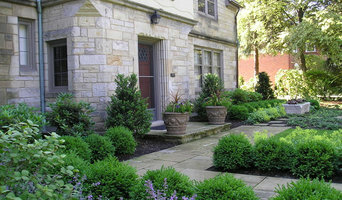 Ohio's premier landscape design, build and management firm. Our energetic team provides highly creative, sustainable and environmentally friendly landscapes for extraordinary space. Award winning landscape architectural design services for residential and select office/commercial/institutional projects. In our creative process we will help clients make value-based decisions while maintaining the beauty and aesthetics of the design. Whether it is a simple planting plan or a set of detailed construction documents, we will work with our clients to implement their project and vision. Responsiveness is our priority. Through mutual respect and collaboration, we hope to create a sustainable, lasting, and beautiful design that meets the value and needs of our clients. For over 75 years, Rice's has worked to redefine landscapes for our residential and commercial clients. Family managed from the beginning, Rice’s has grown to become the premier provider of custom residential and commercial landscapes throughout Northeast Ohio. From design and installation to ongoing maintenance, Rice’s utilizes quality service and materials to exceed customer expectations. Rice’s believes in fostering a positive, supportive work environment, and we take pride in the quality of our team. Each member of the Rice’s staff dresses professionally, conducts themselves in a respectful manner and attends OSHA training courses, contributing to a safe, professional work environment. If you are interested in partnering with Rice’s, please reach out to request a consultation.